Bird and Knoll, follow up their successful debut collection of luxurious cashmere-blend scarves with an equally inspiring Spring/Summer 14/15 collection - 'Tea, Sugar and a Dream'. 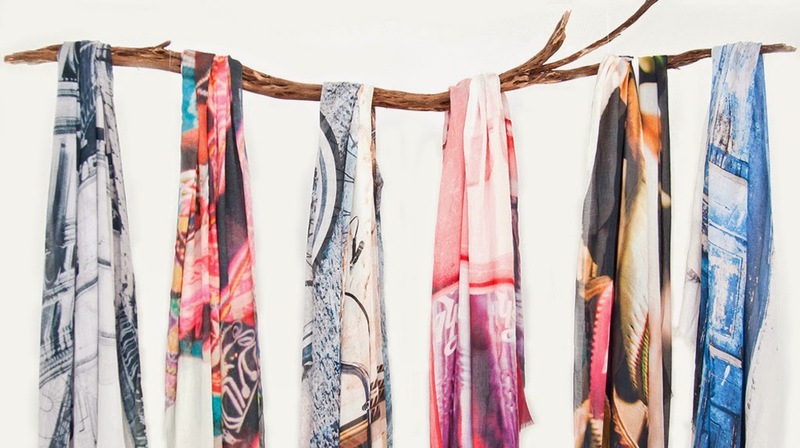 'Tea, Sugar and a Dream' is a collection of beautiful scarves created by New Zealand-born designers Macayla Chapman and Natalie Knoll. The vibrant new collection has been inspired by "the exotic jewel-like hues that you find in places like the markets of Peru or the bazaars of Istanbul", and is founded upon a passion for digital photography and quality textiles. 'Tea, Sugar and a Dream' is brimming full of bold, beautiful colours, exuding luxury and opulence! "Our luxurious oversized cashmere-blend scarves are a narrative of lifestyle and travel inspirations and aspirations. Digitally printed with photographic images from iconic and exotic destinations from around the world, these stunning, versatile accessories will take you from the plane to pool-side, be the final edit of any fashion-forward outfit and become an essential wardrobe staple." These Bird and Knoll scarves are a real statement piece and a definite talking point. I love the versatility of the scarves in that you can wear them as a sarong for a laid back summers day, as a wrap for a sophisticated yet carefree look on a night out, or as an eye catching accessory to complete any outfit - they are truly multi-functional! To add a Bird & Knoll scarf to your wardrobe check out birdandknoll.com for their complete collection of scarves and accessories, and for stockist details.